Kamal Hasan's MNM (left) and T T V Dhinakaran’s (rightAMMK will battle it out against the established parties. From massive props on campaign vehicles to promotion through social media -- the importance of election symbols cannot be overemphasised in this Lok Sabha election in Tamil Nadu especially with several new parties in the fray. All political parties are intensely canvassing for the April 18 polls. 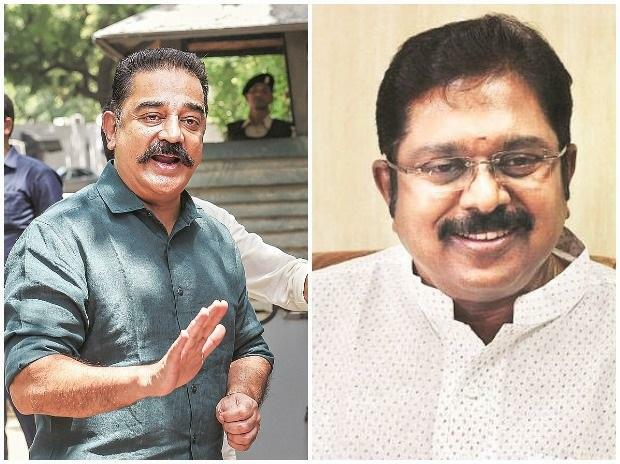 Unlike the established parties like the AIADMK (two leaves symbol), DMK (Rising Sun) and the Congress (hand symbol), the newbies like Amma Makkal Munnetra Kazhagam led by TTV Dhinakaran and actor-politician Kamal Haasan's Makkal Needhi Maiam (MNM) have to work hard to familiarise voters with their candidates and party symbols. However, for the April 18 polls, the Election Commission has awarded 'gift box' as poll symbol. Notwithstanding, Dhinakaran exuded confidence that his party will reap success. National parties are allowed a permanent symbol on which they can contest across the country, while regional parties can contest only in some states on their permanent symbol. When a newly registered party approaches the Election Commission, it is given a list of free symbols to choose from. MNM candidate A G Maurya, who is contesting from North Chennai constituency, said the torch symbol was ideal for their party. "Battery torch gives light, identifies the bad and you know it will enlighten whoever enters the light. Battery torch is going to create a new era," he told PTI. The party is holding promotion campaign through online and other media. "There is a team which is constantly working on propagating the battery torch symbol online and my leader (Kamal Haasan) also displays the battery torch in media giving it visibility," he said. "In my campaign vehicle, we are keeping a giant battery torch. The workers carry a torch light, even if it is day time. So it is easily remembered by voters," he said. Makkal Needhi Maiam recently completed its first anniversary. The party is contesting the April 18 Lok Sabha polls in all 39 seats in Tamil Nadu and one seat in Puducherry. Besides the new parties, election symbol is an issue for the old ones too like Marumalarchi Dravidar Katchi (MDMK) led by Vaiko and Viduthalai Chiruthaigal Katchi (VCK). The MDMK lost its party symbol (top) due to its failure to get sufficient vote share and its candidate A Ganeshamurthi, a two-time MP, is contesting on DMK's rising sun symbol from the Erode (SC) constituency. The VCK is contesting on two different symbols during this elections. Its founder Chief Thol Thirumavalavan is contesting under 'pot' symbol from the Chidambaram constituency, while his colleague D Ravikumar will contest on Rising Sun symbol from the Villupuram constituency. Paattali Makkal Katchi (PMK) leader Anbumani Ramadoss was seen holding a mango, his party's election symbol, during campaigning, while party cadres carried props of the fruit during rallies and road shows. A former senior election commission official said the symbol is crucial for bigger parties. "They have much more at stake. It is not one seat or two seats and when a large number of seats are involved, the symbol becomes important," he said. "If some established party wants to field new faces, the new face may not be known in the constituency. So for him/her to get recognition among voters, he/she needs something with which the voters are familiar and that is the party symbol," he said. It may be recalled that factions led by Sasikala-Dhinakaran and K G Palanisamy were involved in a bitter tussle over securing the "two leaves" symbol of the AIADMK. A giant sculpture depicting the poll symbol is installed at the entrance of party founder and the late Chief Minister M G Ramachandran's memorial located on the sea shores of Marina in Chennai. Noted political analyst Sumanth Raman said party symbol has a certain value but it is diminishing as communication is getting better these days. "In earlier days, to familiarise the people with the symbol was very difficult. In every street the political parties used to hold meetings to make the people aware. There was no social media," he said. "It was challenging for political parties to make voters in rural areas aware about the poll symbol. But, these days, even in rural areas, it will take a symbol in 15-20 days to reach the masses using social media ," he told PTI. "A recognizable symbol has an added advantage. But again, that does not determine the election", he said. Asked about contesting the polls on DMK's symbol, MDMK Erode candidate A Ganeshamurthy said though his party had fought elections on different symbols in the past, he was confident of voters' support.